In an emergency, rescue platforms can help. Every second counts which is why powered access platforms are the number one choice of lifting equipment for many rescue situations at height. The mobility and flexibility of different types of rescue platforms enable emergency services or rescue teams to work at speed and from a secure lifting platform when time is of the essence. – Spider lifts can be used for both internal and external rescue situations and can access and be used in narrow spaces and on fragile surfaces such as paths or floors. – All terrain access platforms move quickly and safely over rough terrain and stabilise on extreme surface conditions including ice and sand. Occasionally the emergency situation might involve rescuing people from the work platform. These types of accidents are rare and powered access platforms have built-in safety controls so operatives can return the raised platform to ground level. However problems can be caused by a range of factors including, but not exclusively, mechanical failure, human error or adverse weather conditions. Though these systems rarely fail, it is vital to have a plan for how people can be brought down safely. Rescue plans should comply with UK health and safety legislation such as the 2005 Work at Height Regulations. It is important to do a risk assessment for the rescue, to keep a record of this assessment and note all details of the rescue as they may be important to refer to at a later date. If it is not possible to repair the lowering mechanisms then a basket-to-basket rescue may be necessary. In exceptional circumstances, where a basket-to-basket rescue is not feasible, emergency evacuation systems such as a crane rescue could be used. Rescue platforms enable emergency services and rescue teams to manage a rescue situation at height, quickly and safely. Rescue planning should be part of the risk assessment and many scenarios can be avoided by careful planning, a trained and competent workforce and a well performing machine, all of which are best practice for anyone working at height. 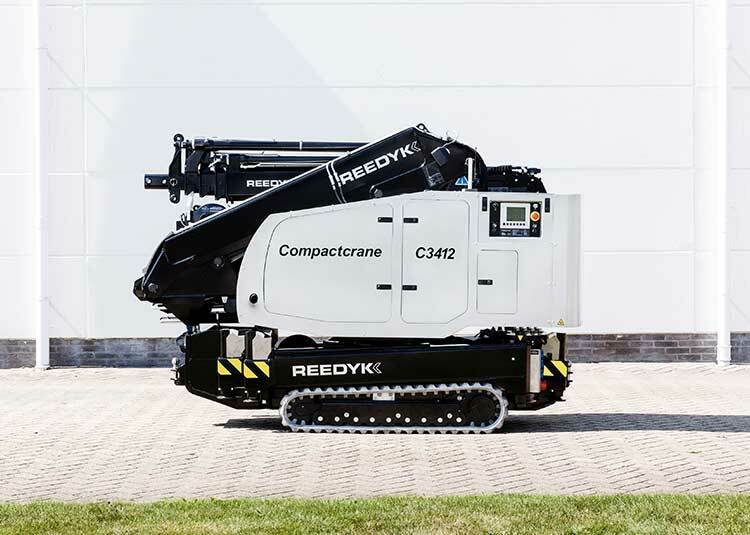 It’s not just the huge tower cranes that get the big jobs done, mobile and adaptable compact cranes can also make a big impact on the building site. Those tricky, hard-to-get-to places inside a building are just where a mini crane shows its value. A Great Dane is no good for ratting – a Terrier is made for the task. So it is with mini Cranes – the mighty Terriers of the awkward place. Lifting heavy loads in confined spaces is always challenging. The use of an A-frame and chain hoists is labour intensive and the use of a fork lift truck entails certain risks. 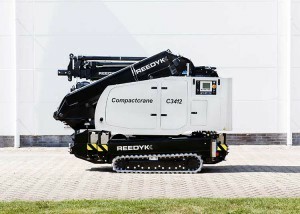 A compact mini crane with a flexible boom is perfect for the job. Hydraulically-powered telescopic legs with step less extendability and a swivel function allow the operator to exactly position the legs where they provide the greatest advantage for the intended lifting position. Set up time is very quick and with white non-marking tracks and fume-less electric power, the effect on their surroundings is minimal. They are also very quiet in operation. This is especially important when installing elements in shopping centres and offices. The new breed of mini cranes also have radio remote control. This expert combination of hydraulics, mechanics, electrical engineering and control technology allows use in places previously considered inaccessible. Operating from a safe distance allows precision and increased safety for everyone. Promax Access provide a range of compact cranes giving you powerful lifting capabilities – right where you need it. Wet winter weather can cause unstable ground conditions and powered access platform stability can become an issue. All you need is a solid foundation to operate safely. Powered access platform stability is necessary to prevent the access platform from overtipping which can lead to entrapment and falls – two of the main causes of serious accidents when working at height. Powered access platform stability can be achieved using a range of tools such as built-in safety mechanisms, careful planning and additional ground protection measures. Ground conditions have a big impact on the stability of access platforms and a ground survey should be completed before every job. Poor conditions may mean further support is required such as spreader plates, timber mats or concrete pads. On soft ground the machine can sink under its own weight the risk assessment should continually monitor the capacity of the ground to bear the lifting weight and any unseen hazards such as underground services such as sewers, drains, manholes, gas and water mains. Rain, ice and even sun can quickly change ground conditions and cause instability. Spider access platforms use outriggers (stabilizer legs) to balance and secure the machine on different levels of a hill, verge or slope and have warning lights on the control panel to indicate when it is not in a solid position. Spreader plates will be required under the outrigger legs of a Spider boom lift as the weight of the machine causes high pressure at the point where the legs meet the ground, increasing the risk of sinking. Spreader plates reduce the heavy loads and pressure at the point of contact between a stabilizer leg and the ground, by spreading the load through a wider area. Powered access platforms are designed to operate on different surfaces but, in inclement conditions, this requires flexibility and regular monitoring of ground conditions. Choose the right type of platform for the job and take time to stabilize the machine in the working environment and the access equipment will do a safe job on most types of ground surface. Statistics from the HSE confirm that in the tree work industry, accidents resulting in major injury occur more than in the construction industry. Over 4,000 people have had their life affected by tree work activities. It’s a dangerous industry. Most of the fatal and major injuries are associated with chainsaw operations, being hit by a falling tree or branches, or by falling. Between 2000 and 2013, 60 people have been killed doing tree work. Because of the high number of accidents in the arboriculture industry the HSE commissioned an evaluation of the use of Mobile Elevated Working Platforms (MEWPs) in such work. It’s a 74 page Report that can be downloaded from the Promax Downloads page here. Since there is potential for improving productivity there is an opportunity to reduce the costs of individual jobs and improve competitiveness. Where there is a reasonable number of trees to be worked on. The HSE Leaflet AFAF403 leaflet describes the safe working practices to be followed when using MEWPs for tree work. Using AFAF403 along with the manufacturer’s Handbook will form part of the risk assessment that identifies the controls needed to be in place for tree work. Since only trained and authorised people may operate the platform and safety at height is the paramount concern, Promax Access training courses maintain the highest standards. For more information regarding the Training programmes please contact Promax Access.